Say hello to your new favorite dessert ever. 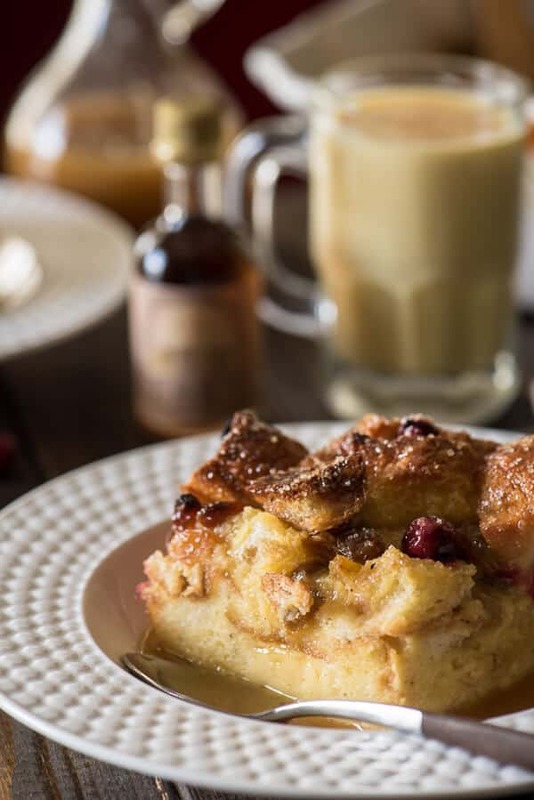 This Eggnog Bread Pudding is totally ridiculous, and should be celebrated with sonnets and parades and fireworks shows complete with the little heart-shaped red ones. And the warm whiskey sauce? Bottle it by the gallon and drink it straight. Or on the rocks, if that’s how you roll. 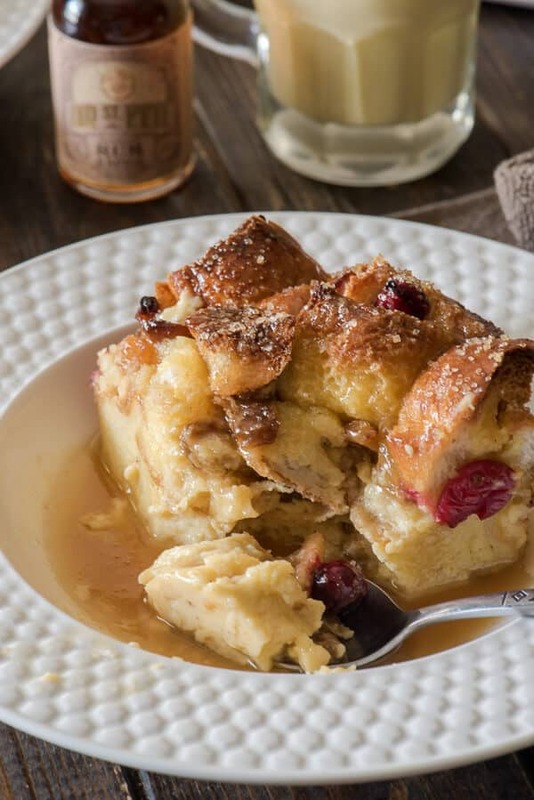 Eggnog Bread Pudding with Warm Whiskey Sauce! I’m pretty sure I’ve enjoyed more than my fair share in the last week or so; between recreating my Spiced Chocolate Eggnog Cake as cupcakes for Thanksgiving dinner (HUGE hit btw – try that if the layer cake is too daunting,) finishing off the bottle of nog in the fridge before we left for North Carolina, and the many variations of eggnog lattes I drank while there. Not too shabby for someone who never cared for eggnog until, like, 2 years ago. Now I don’t know what kind of holiday season it would be without a mug or two of rum-spiked creamy, eggy goodness. I’m so full of Christmas spirit that it’s just shy of ridiculous. AND NO ONE CAN TELL ME IT’S TOO SOON FOR THAT SHIZ ANYMORE! Blame it on the eggnog or the cool Carolina weather; my house already being decked out in red and green, or that I haven’t listened to anything but Christmas tunes since mid-November and I’m slightly embarrassed for myself. Not only is Christmas my fave time of year, but we’ve approached the best part of it – the gauntlet of baked goods! Sometimes I don’t know where I find the stamina to bake and build so many platters of buttery, sugary treats after doing it at work every week. It means so much to me to see the smiles that come from my cookies…which makes it completely worth it. Tomorrow kicks off the 2016 Sweetest Season Cookie Exchange, and I can’t wait to stuff your eyes and mouths with all the tasty cookie treats I’ve concocted, adapted, and recreated. One of Nana’s classics is coming your way, plus lots and lots of chocolate! Like, a truckload of chocolate. But that’s tomorrow. Today is eggnog and buttery bread and rum-soaked raisins and whiskey drizzles. My bread pudding game is strong, guys. Waaaaay stronger than my first go-round 2 years ago, for sure. 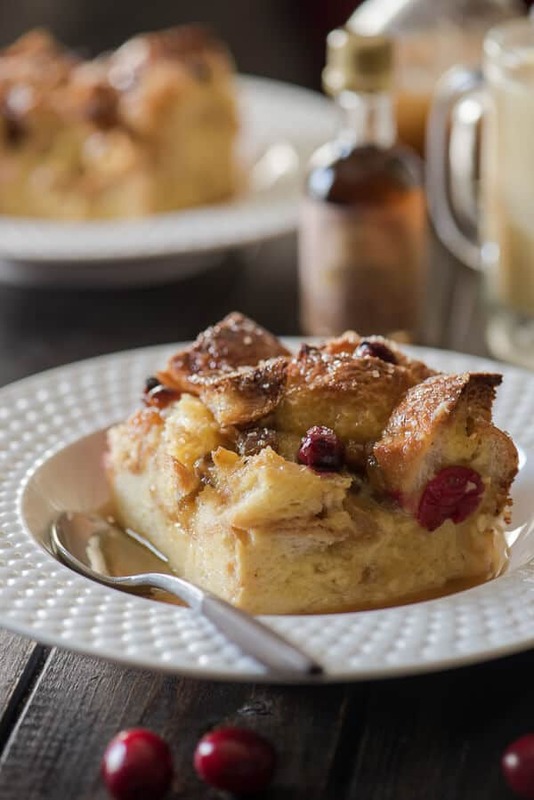 This is bread pudding done right – custardy and dense with just the right eggnog flavor. And surprise! bursts of rum! with every bite! of cranberry or raisin! 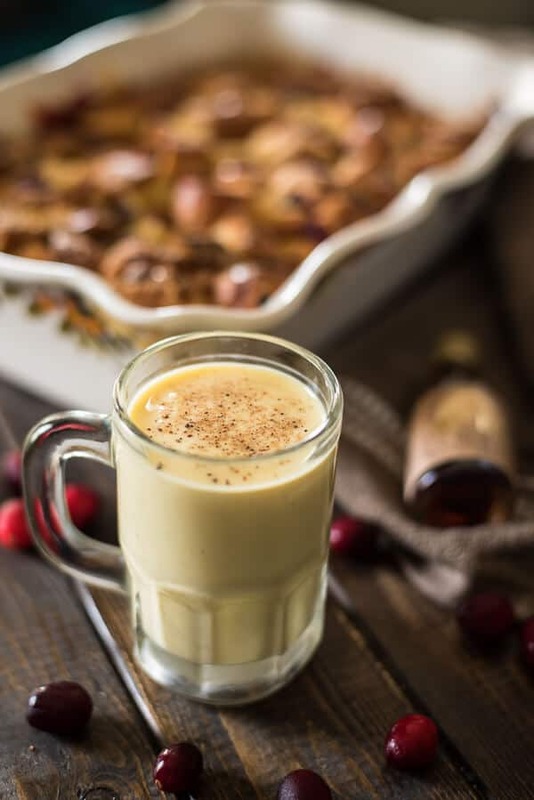 It’s just another delightfully creative way to enjoy eggnog this holiday season – and the convenience of prepping it the night before might be the best part! Especially is this is your idea of breakfast. Which…it absolutely should be. 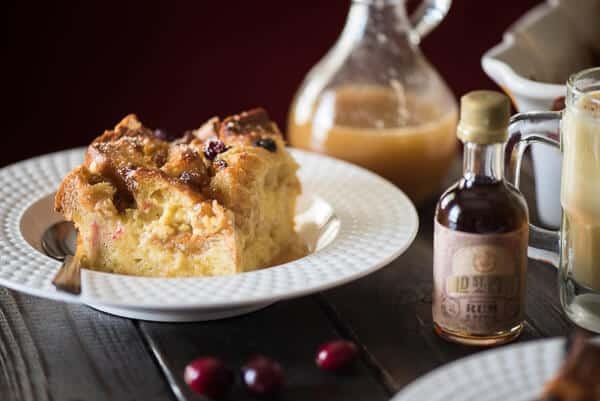 It's just not the holidays without eggnog, and there's no better way to consume it than in a big slice of Eggnog Bread Pudding with Warm Whiskey Sauce! 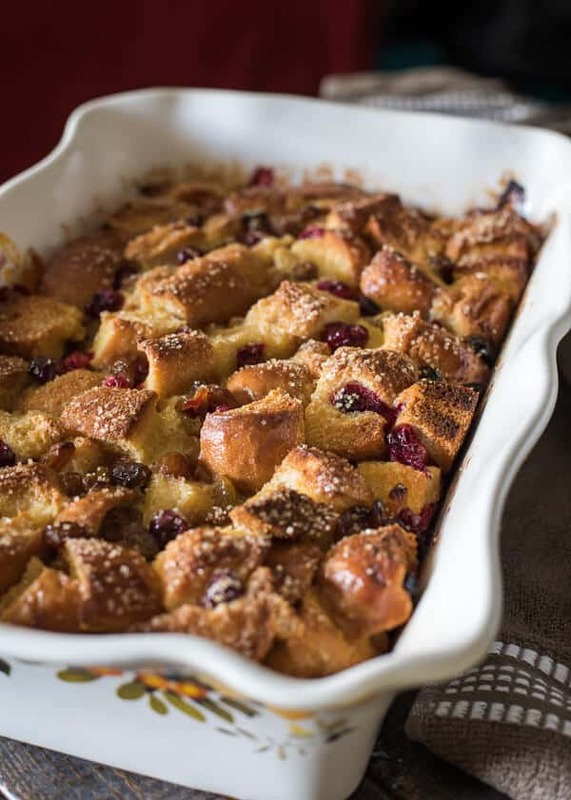 In a small saucepan set over medium heat, combine cranberries, raisins, and rum. 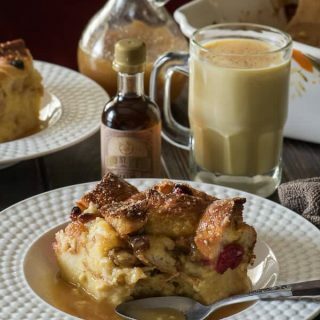 Bring to a boil, then remove from heat and set aside to allow the fruit to steep while you prepare the bread pudding. Butter a 2-quart casserole pan. Place cubed French bread in a large bowl. Drizzle melted butter over bread and toss to coat. Transfer bread cubes to prepared casserole pan and set aside. In a large saucepan set over medium heat, combine eggnog and milk/cream. Bring to a low boil, whisking occasionally, then remove from heat. In the same bowl you tossed the bread cubes in, whisk together eggs, sugar, nutmeg, vanilla, and salt until light and frothy. Slowly whisk 1 cup of hot eggnog mixture into egg mixture to temper and avoid scrambling. Gradually whisk in remaining eggnog mixture until well combined. Strain rum from fruit into eggnog mixture and whisk to combine. Pour eggnog mixture evenly over bread cubes, pressing bread down into liquid to ensure every piece is soaked. Scatter prepared cranberries and raisins over top, then sprinkle with turbinado sugar. Cover pan with plastic wrap and refrigerate 2-24 hours. When ready to serve, preheat oven to 350 degrees F. Remove pudding from refrigerator and unwrap. When oven is ready, bake on middle rack for 45-55 minutes until top is browned, edges pull away from pan easily, and there is no wet jiggle in the middle. Warm Whiskey SauceCombine sugar, cream, and butter in a small saucepan set over medium heat. Bring to a low boil, whisking occasionally. Remove from heat and whisk in whiskey and vanilla until combined. 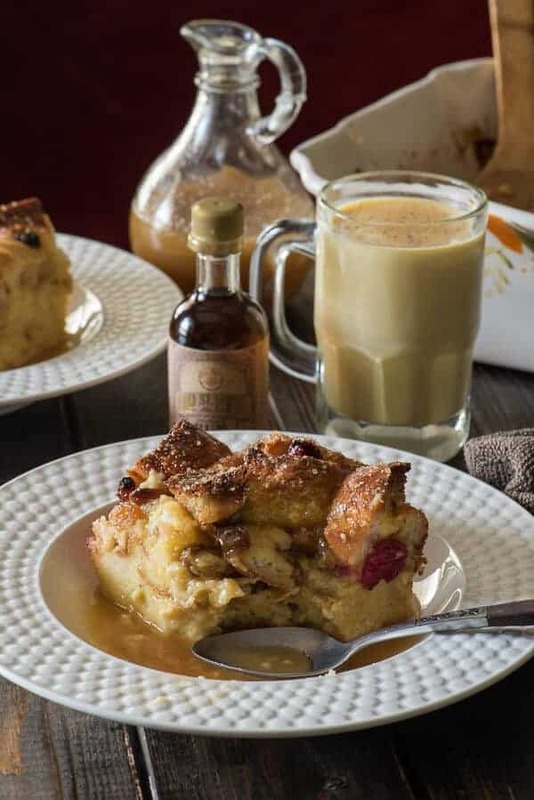 Cool 10 minutes, then drizzle that glorious sauce over plated bread pudding slices. Enjoy! Craving some Nog? 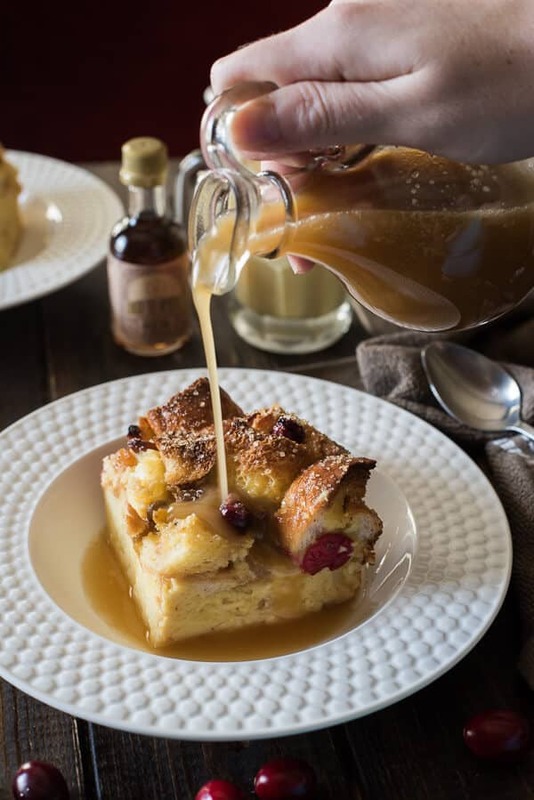 Find your perfect eggnog recipe from this collection by the Sunday Supper Tastemakers! Yes! I mean yes, please!!! Mmmmmmm eggnog makes delicious bread pudding!! I haven’t made some in a long time. I think I need to bake and take yours to work. YUM eggnog and whiskey! And I love the cranberries in it! 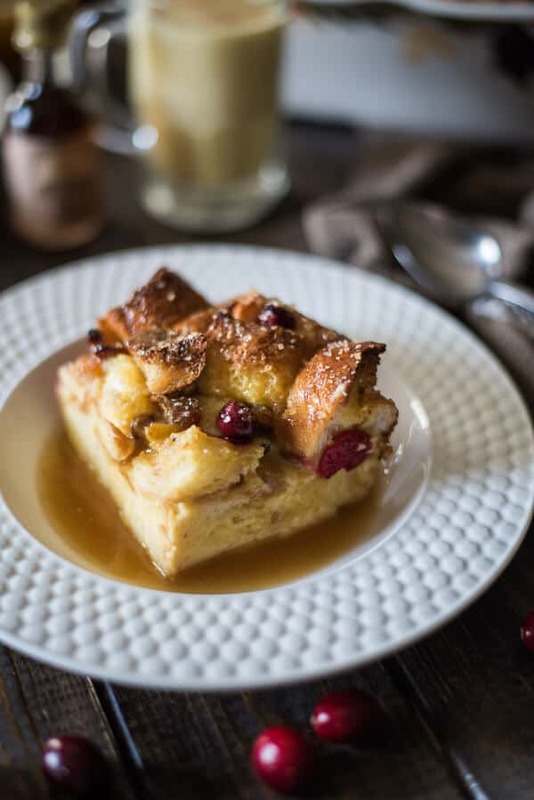 I love bread pudding and this sounds so festive! This looks so good, I love the sound of everything in it! The entire dish looks so good. The pudding looks so luscious, but I could dive head-first into that whiskey sauce.